Every Vanson garment comes with its own unique unit number – proof that the piece was handmade and that it’s yours. Every Vanson jacket comes with an individually stamped Vanson key fob and a warranty registration form which, once filled out and sent back to us, is entered into our computer system’s database*. 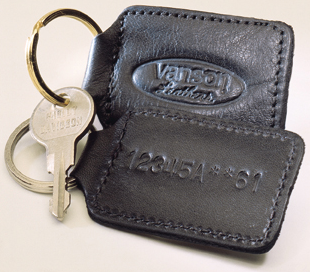 Every Vanson is embossed with its own number. Should your Vanson ever get lost or stolen, we can identify it as yours. In the event of loss due to accident or fire, we can verify replacement value for insurance purposes. This can be especially valuable if your Vanson garment is custom and not available off-the-rack. We archive all custom patterns and repair information, enabling us to duplicate or repair any garment. On a number of occasions the Vanson Unit Number has proved to be invaluable in helping trace a stolen jacket or group of jackets that have been stolen and illegally resold. Point being, the purchase of a Vanson is truly an investment in a rare handmade product – and the Vanson Unit Number helps protect that investment. In 1984 Vanson was located on the 4th floor of Thayer Street, in Boston's South End. ** The neighborhood was not a good one, this was before “urban renewal”. Our stockroom was also our showroom – lots of pipe rack hanging from chains bolted to the beams above, lots of garments stuffed onto the racks. The bathroom was also the changing room.... and all the windows had expanded metal grates over them on the outside; the normal urban fortress. On a Saturday morning I got a call from our downstairs neighbor, who happened to be using his bathroom (directly below ours), to say it was “raining coats past his window”. Turns out a repeat customer had removed the bolts holding the outside grate to the window frame and was now throwing armloads of garments out of the window to an accomplice below. A chase down the stairs and out onto the street ended when a passing police patrol stopped to assist and arrested the thief. However his accomplice at the back of the building and a number of jackets got away. Some weeks later I was at a sandwich shop and recognized one of the stolen jackets on top of the store refrigerator. The police were called and we ended up in court to get the jacket back. In court, on the stand, I was asked how long Vanson had been making coats, 12 years I replied. And in 12 years how many coats have you made?... Maybe 100 per week as a rough number X 52 weeks X 12 years … maybe 60,000, at best... How then could I identify this particular garment? I was asked. Well, I explained, this jacket was a custom order with a C1234 number. It showed in our inventory reports. And predicted that when I ripped open the lining, this custom number would be written on the inside of the lining... which it was. * Operated by highly-trained data-processing experts, using a nex-gen-bleeding-edge-big-data system known, to those who know these things, as “dos”.